Place the potato wedges in the microwave for 7 minutes. Meanwhile, break up the ryvitas in a ziplock bag and bash into fine crumbs. Add the cajun spice, herbs and oxo cube and mix well. Take the chicken fillets and dip them into the egg mix and cover evenly. Let excess egg drip off and them place into the ziplock bag, once all chicken is added give a good shake to cover the chicken evenly in crumbs. Once potatoes are finished in microwave, add a few sprays of frylight. Place the potatoes on one half of an oven tray. Remove the chicken pieces from the bag and place on the other side of the oven tray. Leave for 20 minutes. Cook the corn and beans according to packet instructions. Make sure chicken pieces are cooked through and serve. Sometimes when your eating healthy you just crave a little bit of takeaway. 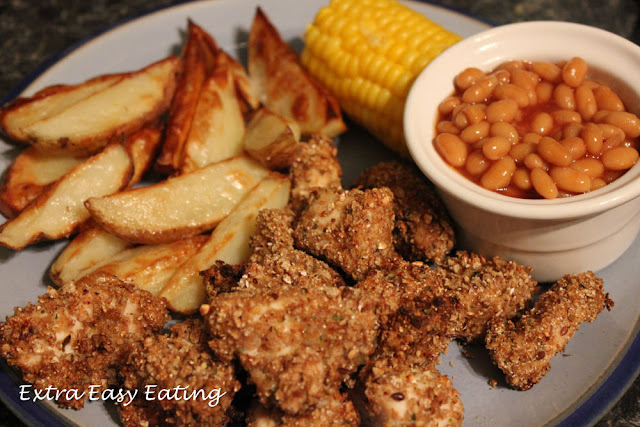 So if you enjoyed a KFC before you joined slimming world then here is an alternative to the original. Lets be honest it's never going to taste as good as a proper KFC but it also doesn't contain all of the calories and saturated fat that like to nicely plant itself on your hips! Enjoy.